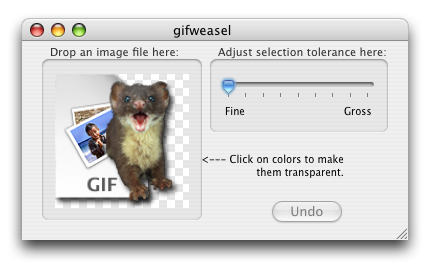 gifweasel is a fun little Mac OS X utility we put together to handle a common web developer's task: converting an image to the GIF image format and making parts of the image's background transparent. Now of course you can do these things with most graphics applications -- applications that take a while to load and learn, cost money, and most importantly, do not have any weasels. Here then enters gifweasel. It's lightweight, it's free, it's easy to use, and yes, there is a weasel. You can also visit gifweasel's cousin, pngweasel, for your PNG image transparency editing needs. The latest version of gifweasel is 1.0, released on May 6th 2008. It runs on Intel-based and PowerPC-based Mac computers and is compatible with Mac OS X v. 10.4.4 or later. If you have any questions or feedback, please feel free to drop us a line at our contact page.